For me it’s always been about the Slush Puppie. I know they make ICEE and SLURPEE and Sonic has their SLUSH …and I enjoy them all…but the others just don’t have that fun factor for me like the SLUSH PUPPIE. Unfortunately you can’t never…and I mean EVER find an original Slush Puppie in any local store around these parts. It’s frustrating. Even MORE frustrating is that SLUSH PUPPIE has licensed the name to all these freezer treats so I get reminded I can’t have the original with a product that tastes like I can’t have the original. 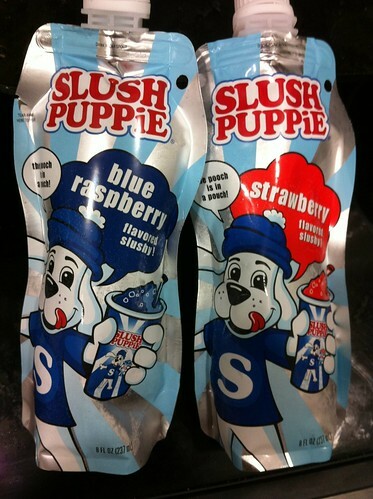 ENTER Slush Puppie Pouches. These are like a Capri Sun package and you throw them into the freezer. In a few hours….PRESTO!!! you get a slush that you can squeeze out the twist of top or just tear open the bag and pour it out into a cup. I chose the latter and here is how things looked. It was very hard and was like more of a frozen sno-cone than slush. The flavor was good and you get quite a bit from the pouch. I found these at Albertson’s by the way. They have this great “Dollar Aisle” where I fine all sorts of unique and interesting things to try. That dollar aisle is also just about the only location around here that carries any type of SHASTA soda on the reg. And who doesn’t love SHASTA? Being slightly unhappy with the texture I decided to improvise. I splashed some ice water in there. Not to change the temperature – but to change the consistency. As you can see here, it worked and I got more of an overall slush effect. I was finally satisfied and my tongue has been electric blue ever since. Still not quite the same as the Slush Puppie I grew up with – but it will do in a pinch.